Wednesday, February 6, 2019, at 6:00 p.m.
$40 per person. Connect with Tracy Jo at the email at the end of this article, or buy tickets online at the Facebook event page. 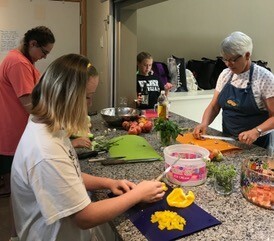 This class is fundraiser for the Heritage Healthy Cooking Classes which have been teaching those with food insecurities since 2014. 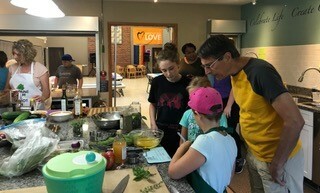 Join us as Tracy Jo Duckworth teaches some basic Ayurvedic techniques and recipes that you can easily create in your own kitchen. Class size is small-just 16 students, please register early. Your $40 ticket includes the 2 hour class, recipes and a sumptuous meal and it might be tax-deductible! In this informative and interactive class, you will learn dishes that are rooted in India’s age-old culinary traditions yet adapted to today’s kitchen and lifestyle. Entrees are wholesome, healthy authentic and made with ingredients that you can purchase easily. Mostly vegan with a little chicken and dairy. Ayurvedic translates into “knowledge of life” and is a 4,000-year-old system of well-being that originated in India. Ayurveda views the human being as intimately connected with the environment and all other life forms. It prescribes various methods of synchronizing ourselves – physically and psychically – with the world around us, placing great emphasis on diet and the specific attributes of different foods. Tuesday, July 25, 1:00 – 3:00 p.m. 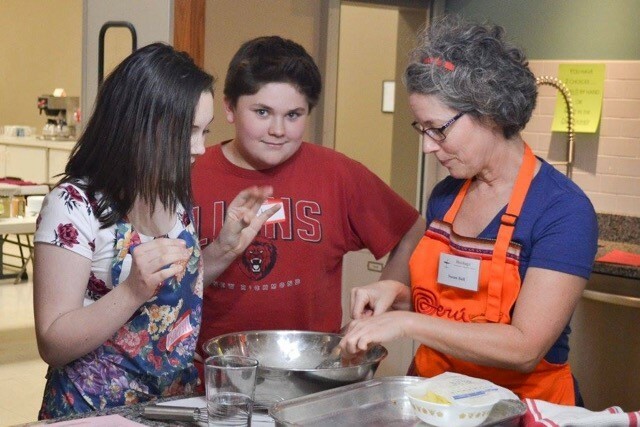 There are four spaces available for Heritage youth ages 7 to 18 for the next hands-on cooking class. They will join a group from the New Richmond Boys and Girls Club. Lots of fun and great food. Contact Melissa Dunlap at melissa.dunlap22@gmail.com to reserve your space. 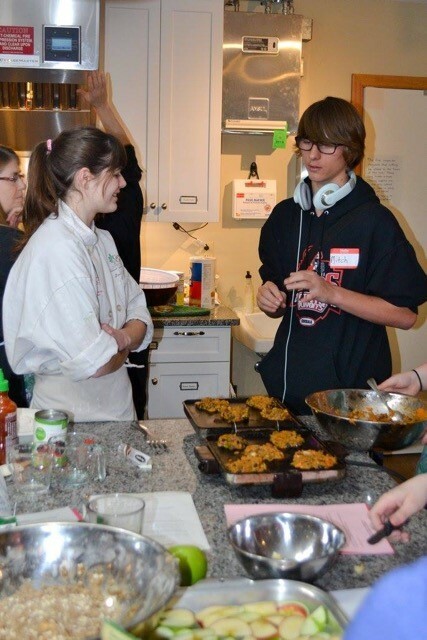 These classes are a fantastic way to empower youth to make healthy choices for themselves. Parents are welcome to stay and watch, but do not need to be present for the class. 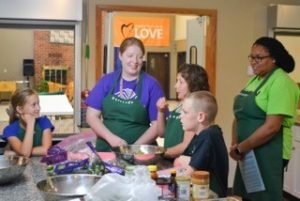 On March 13, 2017, Heritage hosted a Healthy Cooking Class with the Boys and Girls Club of New Richmond. This was done as part of our food justice ministry, from the conviction that access to healthy food is a human rights issue. 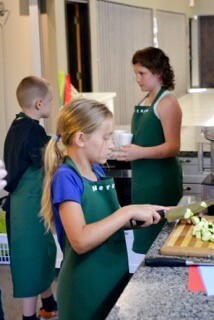 Here are pictures from the class. 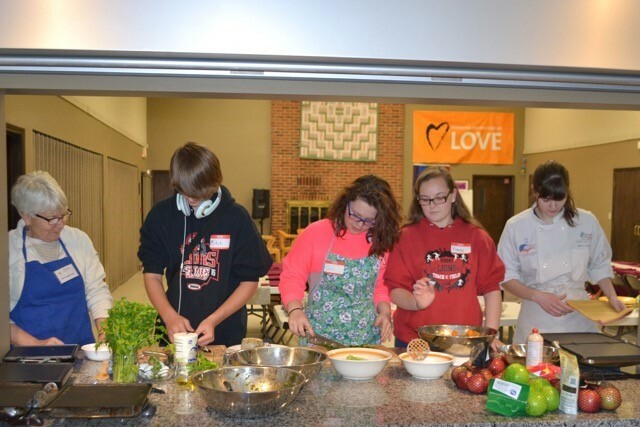 The next Heritage Healthy Cooking Class is Monday, March 13th, from 4:00 to 6:00 p.m. We are partnering with the Boys and Girls Club of New Richmond. Food justice starts from the conviction that access to healthy food is a human rights issue! Our food social justice arm is growing! 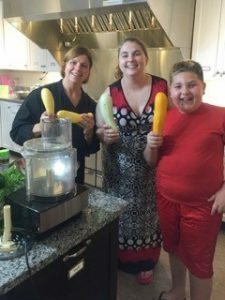 The Heritage Healthy Cooking Classes will partner with the Boy and Girls Club of Greater Cincinnati in 2017. We will be offering age-appropriate classes for middle schoolers from the New Richmond Club in February and March of 2017. Watch for details on how you can be involved. For more information, talk with Tracy Jo or reach her at Healthy-Cooking-Classes@huuc.net. Like Cooking? Like Sleeping? Have We Got Some Jobs for You! The Interfaith Hospitality Network (IHN) relies on volunteers like us to provide food and shelter to families who are temporarily homeless. The next day for Heritage people to help is Tuesday, September 6. We already have a family who has volunteered to be the Activity Hosts that night. (Thank you!) 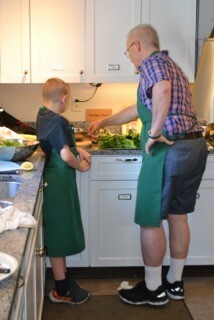 What we need are some volunteers to be Dinner Hosts and Overnight Hosts. Two households often work together to be Dinner Hosts. 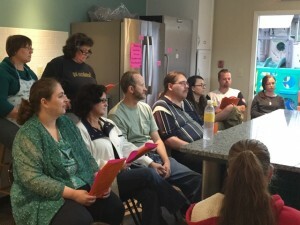 They plan out an evening meal, buy the ingredients, cook it at home and/or at the First Unitarian Church kitchen, then lay out the food buffet style and eat with our homeless guests. They also clean up afterwards. We also need one male and one female adult to be Overnight Hosts. Bob Lamb calls this “The easiest job at IHN – just show up with your sleeping bag and sleep!” There is a little more to it than that, but not much. Overnight hosts each get their own room, and the sleeping bags go on top of mattresses, so it isn’t too bad. Overnight hosts need to have a background check, so please volunteer early to allow time for this. All of these jobs are needed to help families who are trying to regain some stability in their lives, and it is a great way to make a small but meaningful difference in the world. You can read more about the overall program of the Interfaith Hospitality Network. To volunteer or if you have questions, please see Rae Jane Araujo. Tuesday, September 6, 1:30 p.m.: IPM Bag Prep. Wednesday, September 7, 6:30 p.m.: IPM Cooking Class. 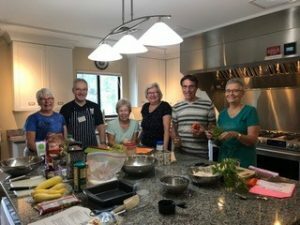 For the past two years Heritage has partnered with Inter Parish Ministry (or IPM) to offer free cooking classes for those in need. 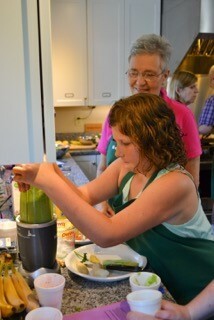 Clients leave feeling empowered to prepare the recipes on their own and make small changes to improve their health. 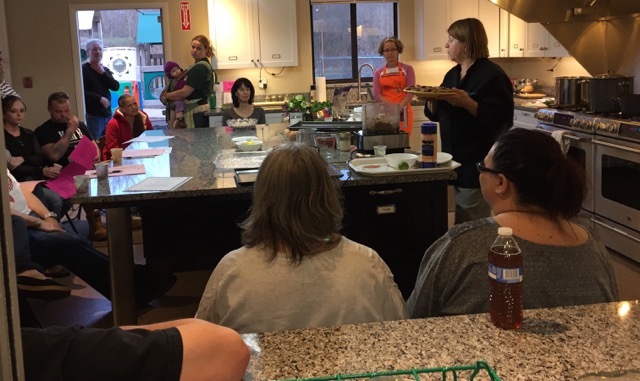 These classes are designed for those in need to gain the basic cooking skills that can enable them to make healthier and more economical food choices. Members and friends of Heritage will be donating hours of preparation time to produce the classes. Over 40 hours of people power are needed to produce one class. 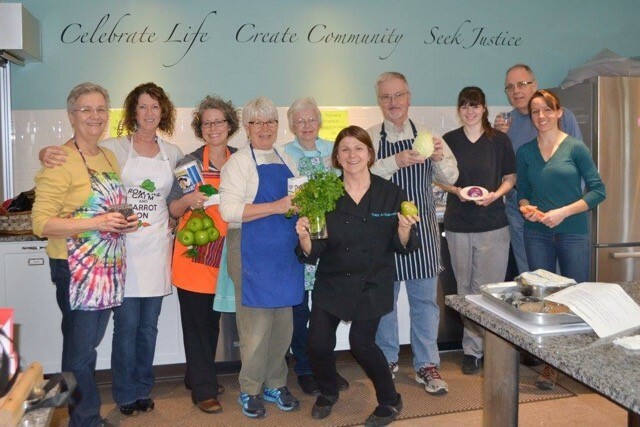 We CELEBRATE LIFE through the bounty of the earth, we CREATE COMMUNITY with the class and especially the meal afterward and we SEEK JUSTICE by empowering those in need to make better choices with their money and their meals. You can attend one or both of these classes for just $20 each. To help with the classes call or email Tracy Jo, 513-310-9029. Wednesdays, March 23 and April 13, at 6:30 p.m. Attend one or more of the classes as a student. Your donation of $20 helps defray the cost of the classes for Heritage. Volunteer to help shop and prepare the take home kits the day before the classes on March 22 and April 12 at 1:30. 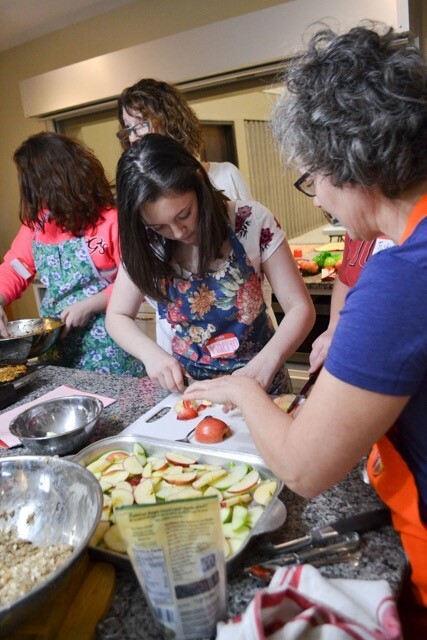 Volunteer to help greet, set-up, give a ride to a client, cook, serve and clean-up on the day of the classes March 23 and April 13 anytime from 5:00 to 8:30 p.m.
Email Tracy Jo or call her at 513-310-9029. For the past two years Heritage has partnered with Inter Parish Ministry (IPM) to offer free cooking classes for those in need. They have been very successful. IPM clients leave feeling empowered to make the recipes on their own and make small changes for their health. 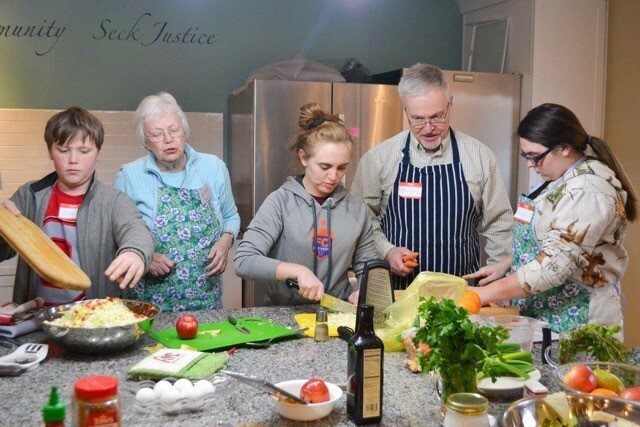 These classes have been designed for people in need to gain the basic cooking skills that can enable them to make healthier and more economical food choices. IPM clients receive the recipes, a meal, a Kroger gift card, and some of the ingredients needed to enable them to make the recipes at home. 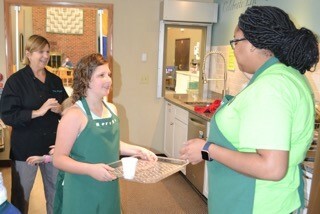 The meal that we serve after the classes is truly a time of radical hospitality. Cooking at home is usually cheaper and healthier than eating out. 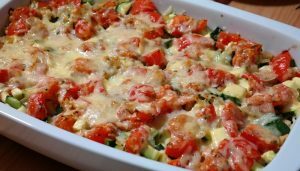 A recent study at Cambridge showed that participants who consumed home cooked meals were almost 50% more likely to be alive after 10 years than their counterparts who ate out or ate highly processed meals. Heritage Church has made feeding the underserved a social justice priority. We need to find additional sources of funding in order for these classes to continue. 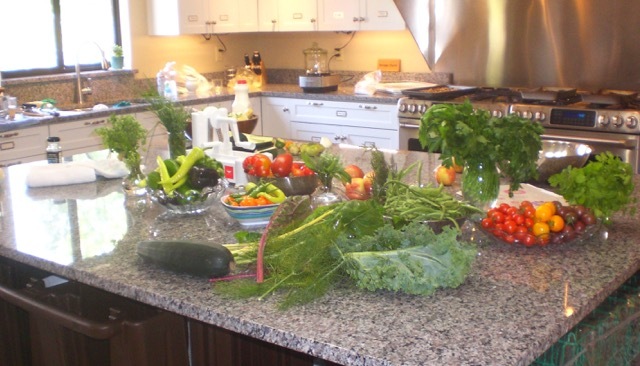 There are grants available for quality programs such as the IPM Cooking Classes. We are looking for someone to step forward to volunteer to write a grant proposal to fund these educational opportunities. Previous grant writing experience would be very helpful for this project. Contact Tracy Jo at 310-9029 or tracyjoduckworth@gmail.com for more information.